Artist's concept of NuSTAR on orbit. 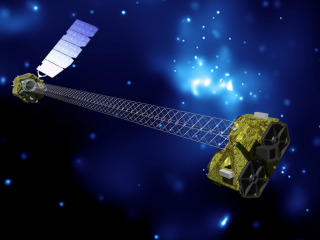 NuSTAR has two identical optics modules in order to increase sensitivity. The background is an image of the galactic center obtained with the Chandra X-ray Observatory. This story was updated at 10:07 a.m. EDT. NASA is counting down to the planned launch of its newest space telescope today (June 13) on a mission to search for black holes in the universe. The $165 million Nuclear Spectroscopic Telescope Array (NuSTAR) mission will hunt for black holes by scanning X-ray light at higher energies than any spacecraft before. The NuSTAR telescope is set to launch atop an unmanned Orbital Sciences Pegasus XL rocket, which will be carried into launch position by an L-1011 "Stargazer" jet aircraft taking off from the Kwajalein Atoll in the South Pacific. The launch was originally slated for 11:30 a.m. EDT (1530 GMT), but has now been pushed back by half an hour to noon EDT (1600 GMT) to allow technicians to check out a minor technical issue. The issue has now been cleared, but the timeline is slightly delayed from the extra work. The vehicle has a four-hour launch window available today. Forecasters predict a 90 to 95 percent chance of good weather for the launch, with only a slim chance of rain threatening the liftoff. The NuSTAR project is one of NASA's Small Explorer missions, and is expected to spend two years mapping the universe's black hole population. The school bus-size NuSTAR will target some of the most mysterious parts of our universe, such as the high-energy regions where matter is falling onto black holes, as well as the leftovers from dead stars after they've exploded in supernovas. "It really is a new way of doing business to try to focus on the hard X-ray," said William Craig, NuSTAR instrument manager at the University of California at Berkeley, during a Monday briefing. About 70 minutes before launch, NuSTAR's carrier plane will depart Kwajalein and fly to a spot 117 nautical miles south of the atoll, where it will drop the rocket at an altitude of 39,000 feet over the ocean. "The review determined that there were no remaining open issues or concerns, and all action items were closed," according to a NASA statement. NuSTAR was originally scheduled to launch in March, but NASA delayed the mission to allow time for further checkouts of the rocket software. "We decided to postpone the mission to allow additional time to assure that the flight software to be used with the new Pegasus flight computer would issue the commands to the rocket as intended," said NASA launch director Omar Baez. "Since then, the Orbital and NASA teams have extensively reviewed the flight software in the associated simulation models used for its checkout, and it's now ready for flight."